Work. The place we spend the majority of our time. In fact, most of us burn more hours making copies, crafting e-mails and attending meetings than spending time with family and friends. It is no wonder the workplace has become the latest Match.com, bringing singles together in the name of love. The question becomes: What should employers do to protect themselves? Romance policies, outlining the dos and don’ts of workplace romances (and, in some instances, even forbidding them), within an organization are the most common tool used. 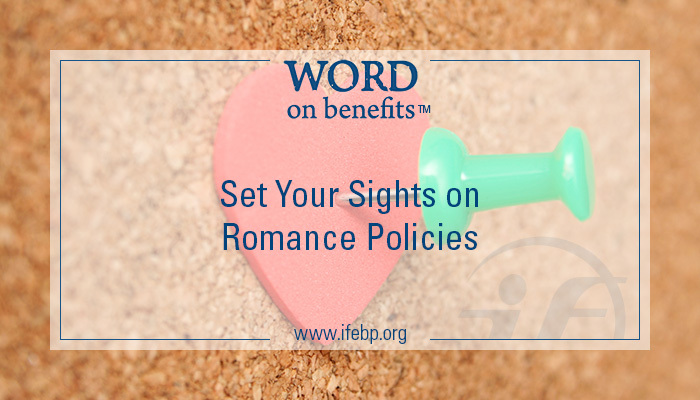 However, in a recent survey conducted by the Society for Human Resource Management (SHRM), only 42% of respondents had any sort of “romance policy” documented—leaving 58% in a vulnerable situation with the door open for interpretation. Additionally, there is a shockingly low occurrence of training for management on how to handle these situations. In fact, the SHRM survey found only 19% of respondents had received any training regarding workplace romance. Workplace romances are going to happen. (I can personally attest to this, having married a former co‐worker.) It is critical for organizations to protect themselves. Document your policies, communicate your policies and train those who need to be trained. Workplace romances are the new definition of extracurricular—and a potentially risky one at that. Don’t leave yourself hanging.